I have heard so many praises from my fellow food bloggers about a book titled - The Last Course: The Desserts of Gramercy Tavern that I decided to purchase a copy for me. However, it turned out that the book has been out of print for sometime. I have searched numerous used book stores but no sight of it then I found copies available at Amazon but I wasn’t ready to pay hundreds dollar for it. Nevertheless, I finally made the purchase and I’m glad I did. This beautiful book by Claudia Fleming is a gem. Her minimalist approach and use of local, seasonal ingredients in her desserts are so inspiring. Her recipes seem simple to make but they all have a little twist (cracked-pepper ice cream anyone?) to them making them special and unique. Who is Claudia Fleming? She was the award winning pastry chef at the famed Gramercy Tavern in NYC but in 2006, she and her husband (also a renowned chef) moved from New York City to Long Island, New York, to open The North Fork Table & Inn, which features a seat-in restaurant and guest rooms. Btw, I just found out she re-printed her book and you can order it off her site here. Place the butter and sugar in a bowl of a stand mixer fitted with a paddle attachment. Cream the butter and sugar until smooth over medium speed until the mixture is smooth, fluffy and light in color. Add the honey and beat until combined; set aside. Combine the flours, salt, and cinnamon in another bowl then add to the butter mixture in two batches, scraping down the sides of the bowl between additions. Mix until the dough is well combined. Wrap the dough in plastic and form into a disk. Chill until firm, at least an hour and up to two days. Preheat the oven to 325°F/165°C. On a lightly floured surface roll out the dough to 1/8 inch thick. Use a rectangular cutter or knife to cut out the dough to fit the tart pans, press the dough gently into the tins, trimming away any excess dough. Prick dough all over with a fork and let chill for 20 minutes or until the dough is firm enough. Chill longer if necessary. 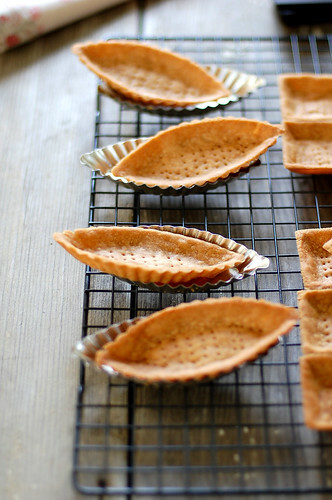 Bake tart shells until golden brown, about 20 minutes. Transfer to a wire rack to cool. They can be made a day in advance. Also, they can be kept up to 3 months in the freezer when stored in an airtight container. Combine ¾ cup of the milk and 3 tablespoon of the sugar in a medium saucepan. Bring to a simmer over medium heat. Meanwhile, in a large bowl, whisk together the egg yolks, cornstarch, and the remaining 2 tablespoons sugar. Whisk the remaining ¼ cup milk into the yolk mixture. Remove the milk mixture from the heat and add a little of the hot milk to the yolk mixture to warm it, whisking constantly to keep the yolks from cooking. Pour the egg yolk mixture into the hot milk mixture, whisking constantly as you pour. Return the custard to the stove and bring it to a boil, whisking constantly. Let the custard cook for 1-2 minutes until it thickens. Add the cream cheese and vanilla and whisk until smooth. Using a fine sieve; strain the mixture into a clean bowl. Cover the surface with plastic wrap and refrigerate until chilled. Beat the heavy cream over medium speed until soft peaks form. Whisk the pastry cream until smooth and fold in the whipped cream until combined. In a medium saucepan combine 1 cup of the blueberries with the sugar. Cook over low heat until all the berries have popped and the juices come out. Strain the mixture into a bowl and discard the solids. Add the rest of the blueberries into the syrup and toss to combine. Wash and pat dry kumquats. Remove calyces, cut them in half horizontally then pit with a fork. Bring sugar and water to boil, add the kumquats. Cover with a paper towel (directly on kumquats) and cook for 2 minutes over medium heat. Remove from heat and let sit overnight at room temperature. Trash the paper towel and remove the kumquats and transfer to a bowl. Reheat the poaching syrup to a boil then remove from heat. Add the kumquats back into the syrup and let sit overnight at room temperature. 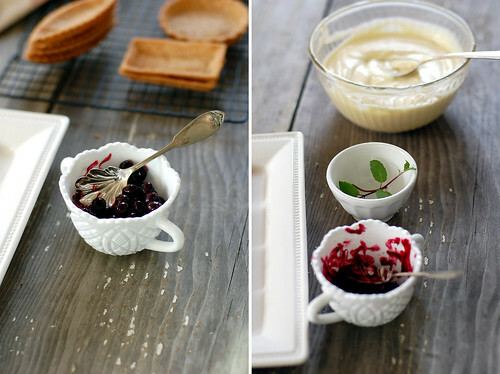 Place the compote (discard the syrup) in an airtight container and keep refrigerated; good up to a week. 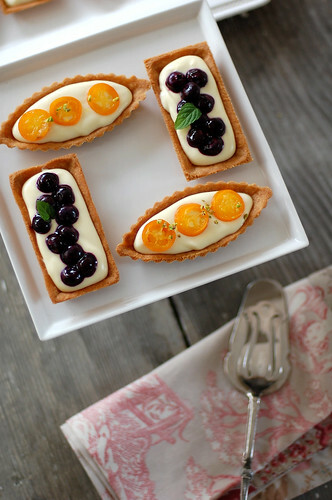 Spoon the pastry cream into each tart shell and top with the blueberries or candied kumquats, sprinkled with finely chopped pistachios. Serve soon after assembling. sounds so tasty!I will try it! they look so pretty & delicious! i love that book too. fantastic! i love all ...all all of them.....cute ;-)and those pic were nicely done....pleasure as always to drop by...!! 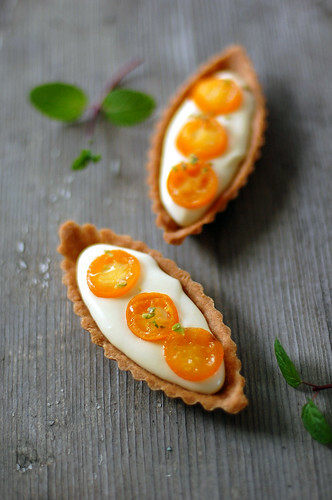 wow, what beautiful tarts: and such pretty photos! totally cute. These are so beautiful! I've never seen such adorable little tarts. 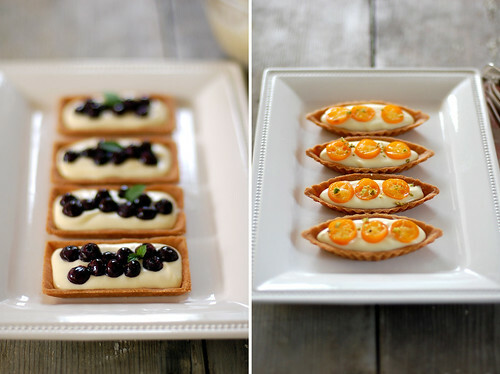 I absolutely must make these once I get my hands on some of those little tart molds. WOW...absolutely amazing... 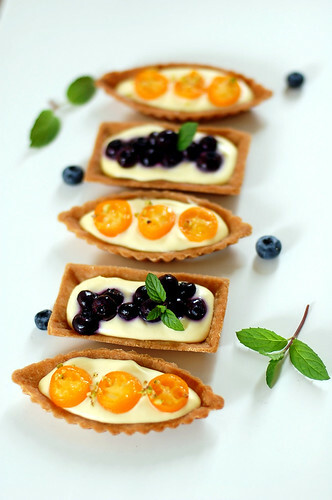 Your little tarts are simply perfect!! 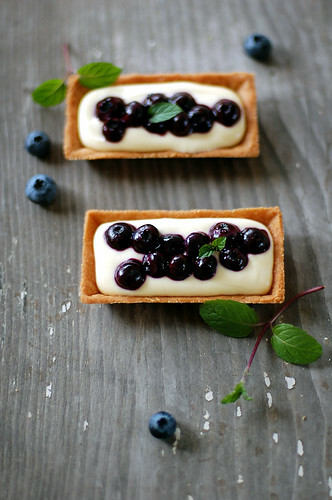 Mmmmm, these tarts look SO yummy! Beautiful photos! Those are so pretty and yummy..
by the way where did you buy the shell?? They are absolutely scrumptious and a stunner at any party!